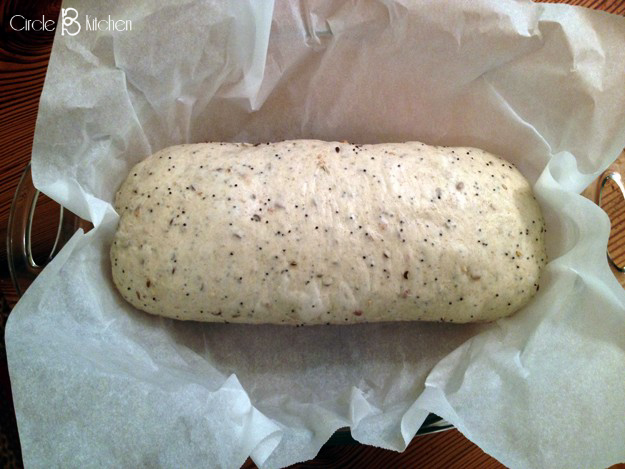 OK all you bread bakers out there…here’s one you’ve gotta try. Wait, even if you don’t consider yourself a bread baker, you should still try this. I mean, for such a simple recipe, this turns out to be a pretty sophisticated loaf of bread with great texture, complex flavors and a crisp exterior that’s enough to make any baker happy. The Husband has declared it his all-time favorite bread. 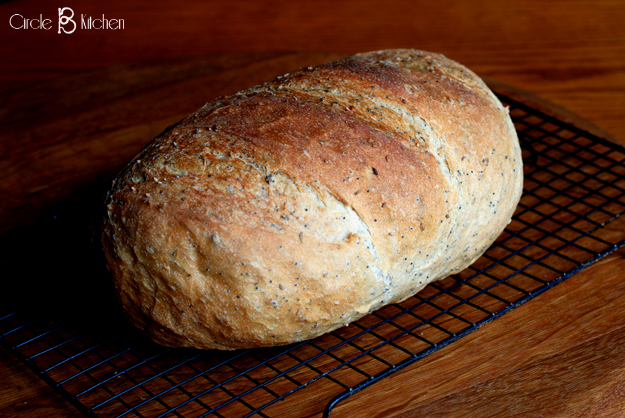 It really is good stuff, but I have to qualify The Husband’s enthusiasm if just to let you know that he really loves rye bread and with a little rye flour and the addition of caraway seeds, this bread has a very distinctive rye bread quality. 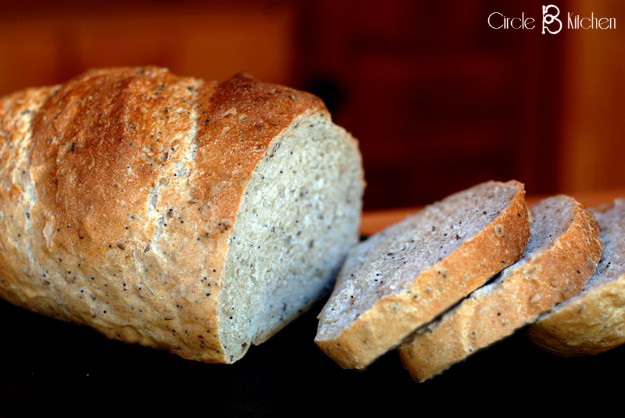 If you’re not a fan of rye bread, just substitute the caraway seeds with another seed of your choice, or leave em out altogether. 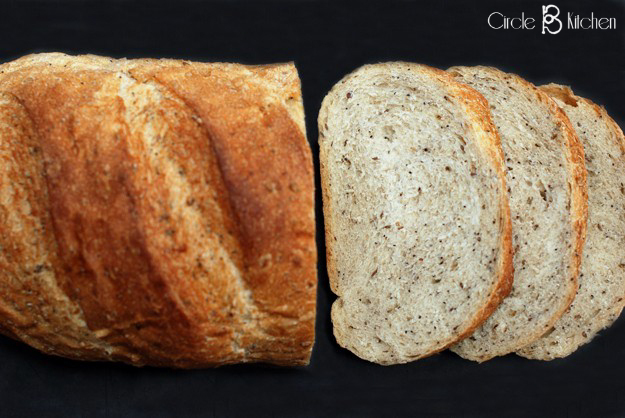 Beyond the great flavors created in this bread, I think the most outstanding characteristic has got to be the crust. I’ve made a few loaves of bread in my day, but the crust on this loaf is pretty special… sort of a dark mahogany and crusty so that you can sort of knock on it and it snaps back at you. But then when you cut into the bread, the interior is soft and fluffy and ever so scrumptious. Bakery-worthy, for sure. A big shout-out to the excellent bakers at King Arthur Flour for this awesome recipe. And also to the home bakers who comment on their website with helpful modifications, adjustments and insights. This recipe was greatly influenced by some of those comments, especially the baking of it in a heavy cast iron pot. This is optional, of course, but I think it really does create just the right environment for a perfectly crusty crust. I’ve made this bread a few times and thought that I would experiment this last time by forming the dough into a longer loaf as opposed to a round loaf. I was wishing I had the appropriately rectangular baking vessel, but managed to sort of make the round one work. 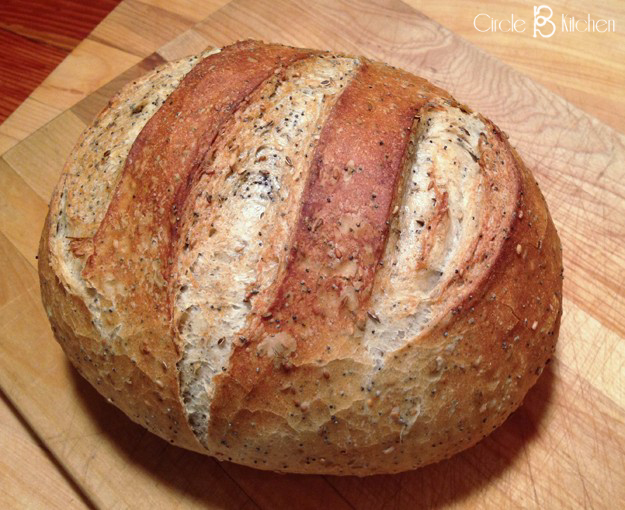 This recipe turns out an amazingly delicious loaf of bread with a dark, crisp crust and soft, flavorful interior. I have used italics to note the changes I made to the recipe. If you would rather not bake this in a crock, you can simply place the loaf on a parchment-lined baking sheet for the second rise and then place that in the oven for baking. Easy peasy. Feel free to leave out the seeds or add your own blend or K.A. 's Harvest Grains Blend. I've given you the recipe for the seeds that I added. Combine the seeds in a small bowl and set aside. 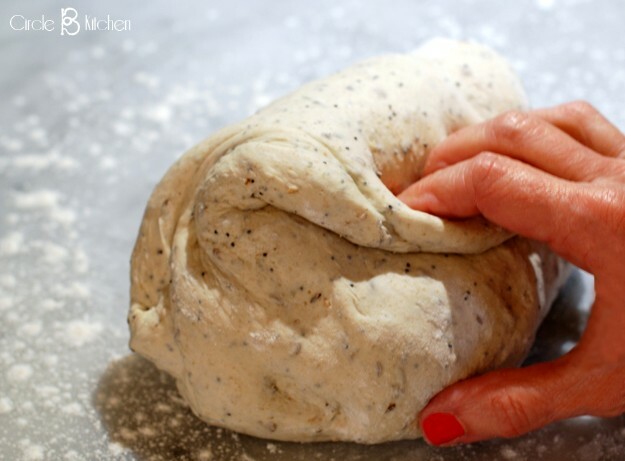 Turn the dough out onto a lightly greased surface, and form it into a ball. Place on a lightly greased or parchment-lined baking sheet, or into an ovenproof crock (I placed it in a parchment-lined bowl). Cover and let rise for about 1 hour. Towards the end of the rising time, preheat the oven to 450°F. (I placed my empty cast iron pot with the lid on in the oven for at least 20 minutes to get really hot. Gently but firmly slash the dough across the top, then spritz it with water. (At this point I removed the cast iron pan from the oven and removed the lid. Grab the edges of the parchment paper and transfer the dough to the hot pan. 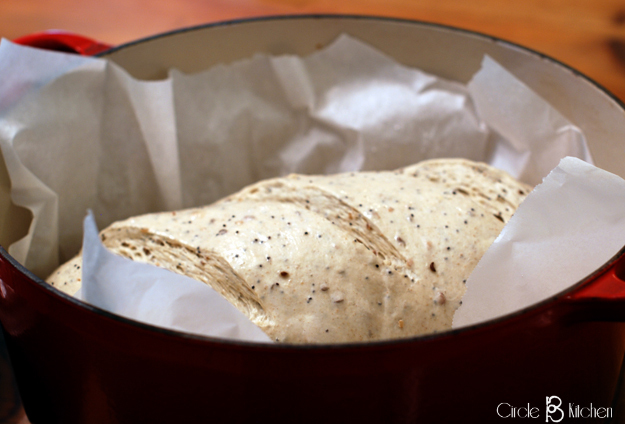 Place the lid on the pot and bake the bread, covered, for 15 minutes. 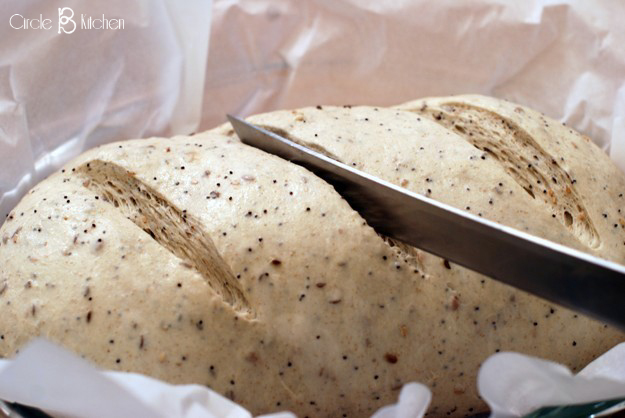 Remove the lid and let the bread continue baking for another 15 to 20 minutes or until it's deep golden brown).If using a baking sheet, bake the loaf for 30 to 35 minutes. Remove it from the oven and place it on a rack to cool. Cool completely before slicing. Yield: 1 loaf.